It poured rain but only after a couple of million dollars in fireworks lit up the sky, then a gale hit, while a drifter followed and Australian Sports Anti-Doping Authority was keeping watch for illegal drug use in what was an eventful week that saw a new title holder take out the International 14 Australian Championship on Sydney Harbour. Helmsman David Hayter and his relatively lightweight crew Trent Neighbour sailed the first Queensland boat in 50 years to win the Australian title in the 14ft class. Not a bad effort in the aftermath of the NYE pyrotechnics and associated traffic on the harbour, and considering they are sailing the only active 14 in the Sunshine State at the moment. But hey, where there is a will there is a way. Hayter’s winning boat El Diablo is a Paul Bieker-designed, Canadian pre-preg carbon built B5. El Diablo is one of three B5 hulls built in Canada and shipped down under in 2009. The other hulls went respectively to Western Australia and Victoria. The former is owned by seven-time Australian champion and defending title holder Brad Devine. Brad and his crew Ian “Footy” Furlong hail from that bastion of 14 champions in Australia, the Perth Dinghy Sailing Club. Think Ray Hancock, Darryl Anderson and his Brad’s dad and former World Champion Bill Divine. While the B5s finished 1,2,3 at the recent nationals, there is a bit of a shake up underway in the land of OZ with three new Dave Hollom ‘Departure’ designed 14s built by China New Yachts which are due to be finished in early 2016. But it was the B5 El Diablo sailed by Hayter and Neighbour that dominated the Sydney regatta with Huey throwing just about everything at the fleet from sub-5 knot drifter through to a 37 knot blow out that ended – not surprisingly – with an abandonment. 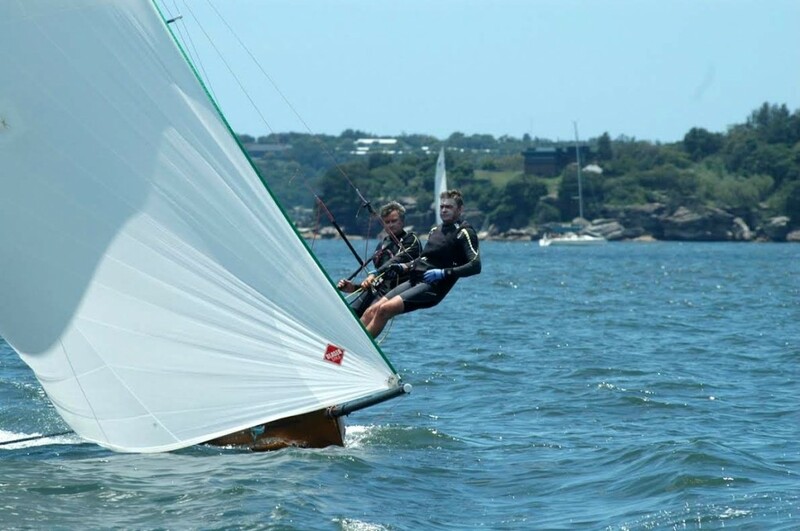 That race was not aborted until the fleet were well out into the harbour leading to a true ‘bash’ over a couple of kilometres to windward to get back to the host venue, the Woollahra Sailing Club. The 14s certainly put on a bit of a show to the youth sailors in the 420 and 29ner classes, who were also having their nationals at the same club. Those youth sailors never left the shore that day and watched as the 14ers literally blasted home in an ugly, gusty sou’wester. The Australian Sports Anti-Doping Agency were at the club keeping a close watch on the youth sailors and were probably tempted to check the 14 crews to see if they weren’t ‘on the juice’ to have even contemplated a gale force, 34knot-plus race. Hayter and Neighbour were however quite clear headed in all conditions, which included some record rainfall across Sydney, and appeared to have added a genuine ability to find real speed in a wide band of breezes. Runner up at the Australian championship was seven-time title holder Brad Devine and his long-time friend and crew “Footy” who stands at somewhere around 194cm and once weighed in at about 105kg … hence the footballer inspired nickname. Brad and Footy are a class act but they have sailed precious few days over the past 12 months and while never too far away from the lead, they suffered from not enough hard racing in the lead up to the championship. Third were Chris Vaughan and Matt Balmer from Victoria in the well prepared (another B5) Ron Jeremy who had good speed and consistency. Chris is now looking forward to taking delivery of his Hollom and the fleet can be assured he and Matt will continue to be a force. The Sydney regatta attracted a relatively small fleet but it seems a bunch of crews were saving themselves and their wallets for the 2016 i14 World Championship to be sailed at Carnac, France. The Australians are sending at least 18 boats to Carnac and the estimated total fleet size is likely to be somewhere around 90 in the land of Charlie Hebdo. Should be a load of fun … des vents favorables. – Neil Patchett. → 2016 World’s – Container Booking!